All of our hams are fully cooked, honey glazed, and spiral sliced. They are available all year long. During the holidays we recommend that you reserve a ham, especially if there is a particular size you need. Nothing but the very best for our customers . . . When you buy a honey glazed ham from Honeycutt Farms you're getting that same old-fashioned flavor that grandma and grandpa used to enjoy. Our specially selected hams are glazed to perfection with our own secret recipe of honey, spices, and seasonings to give it that special sweet "crusty" coat to seal in that wonderful old-fashioned taste. Easy to prepare . 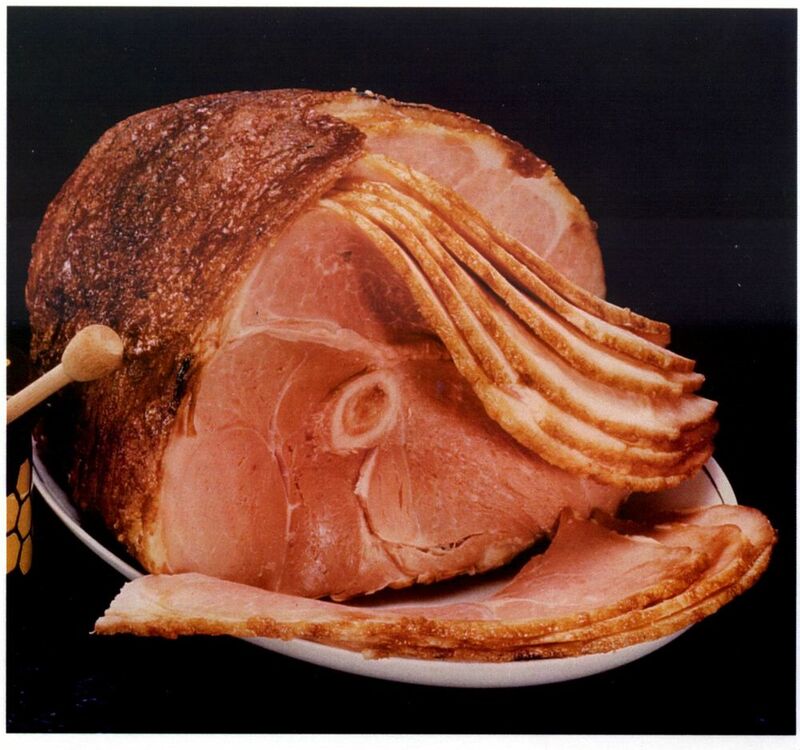 . . To make serving easy, your Honeycutt Farms Ham is spiral sliced around the bone. The slices remain in place until you're ready to remove them and enjoy. Your gourmet ham is fully cooked and ready to serve the moment you get home. Serving is simple . . . By adding a garnish and allowing the slices to fan out from the bone naturally, your Honeycutt Farms Ham can be elegantly served on your favorite platter. To remove the slices, run a sharp pointed knife around the bone. If whole slices are larger than you wish the servings to be, cut along the fat line first and make smaller portions. Allow 8 ounces per serving. To serve warm, remove the ham from the green foil, wrap in aluminum foil and place in the oven at 250 degrees for an hour to an hour and a half. Still great after freezing . . . Ham should be consumed within 5 to 7 days unless frozen. Leftovers may be frozen for up to 8 weeks if tightly wrapped in foil or freezer bag. During freezing the glaze will crack and probably fall off, but the taste will remain. Thaw in refrigerator for 24 to 36 hours.